I was so hopeful when I pulled the cheesecake from the oven – it looked perfect! But as it cooled, the crack started to develop and my heart sank a little more as it got bigger and bigger. Sometimes you can live with a crack in your cheesecake – maybe you’re going to cover the top with whipped cream or strawberries, and no one will ever know the difference. But other times you can’t hide the crack and need to fix it, which was certainly the case for me this weekend. So, here’s what you do. After cooking the cheesecake, let it cool and then refrigerate as directed in the instructions. When it’s fully chilled, it’s time to repair the crack. All you need is an offset spatula, hot water and a kitchen towel. Dip the offset spatula in the hot water, then dry the spatula with the towel. Use the spatula to gently press down on the cheesecake in the area of the crack and spread to fill it in. You’ll get the hang of the gentle press and spread motion quickly – it’s fairly simple. Repeat until the crack has been completely filled and the top is smooth! Well mostly smooth anyway, it might not be 100% perfect. You can still see a small imperfection in mine, but hopefully we can agree it’s about a million times better than it was in the before pic, right? 🙂 After you repair the crack, you’ll want to chill the cheesecake again to give it a chance to set. I mentioned the other day that I don’t often make cheesecakes because of the time commitment involved. While that’s true, there’s also another reason I avoid them, and it’s the possibility of cracks, which frustrate me to no end. There are several things you can do to try avoid cracks in the first place – start with all of your ingredients at room temperature, try to avoid overmixing and incorporating too much air into the batter, bake your cheesecake in a water bath, run a thin knife around the edges of the pan to loosen the cheesecake when it comes out of the oven (so as it cools the edges can pull away from the pan), and maybe most importantly, avoid overbaking. Overbaking is usually my downfall – I find it so hard to gauge doneness. I feel much better knowing that if all else fails and I do wind up with a crack in my cheesecake, I can fix it if necessary! 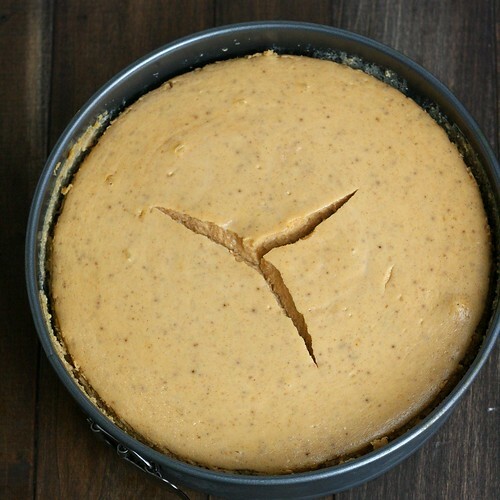 38 Responses to "How to Fix a Cracked Cheesecake"
Great tip! I’d never heard of this method before. Nice job with that! I don’t remember if, in your original recipe, you baked it in a water bath. If not, that should help with cracking. Ugghh I hate cracks and they happen to me almost every time. Thanks for the tips! That is remarkable! 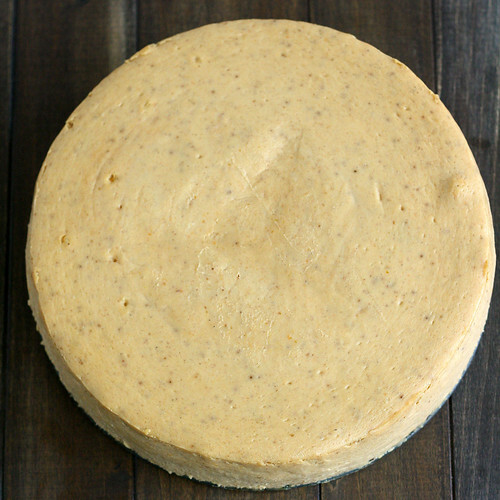 I love making cheesecakes….although like you, the cracks frustrate me to no end. Since my cheesecakes are usually chocolate themed in some way, I often put a ganache on top and call it a day. But this is a great trick to have up my sleeve for those non-chocolate desperate times! Nice tip! Despite the most careful baking cheesecake cracks seem to happen more often than I’d like. It’s great to know how to fix them! Great tip. I seem to have better luck when I mix the batter in a food processor. Plus if you already made the crust in it no need to drag out another appliance or wash the bowl in between. WOW!! Thanks for the brutal honesty and photo sharing. I would have.never.guessed! Great tips and tricks, Tracey! Tracy!! This is such a great tip – I am kicking myself for not figuring this our sooner! Cracks in cheesecake are my arch nemesis 😉 Thanks for sharing! Awesome tip!! Maybe it will give me enough backup plans to make my own cheesecake! I have been held back by all the horror stories of how they can go wrong but it is my favorite dessert!! This tip is going to come in so handy! All my cheesecakes always crack (no matter what method I try) so this is much needed in my house! Thanks so much for sharing! Whoa! Who knew! I wanna make a cheesecake so I can try it! I love this tutorial! I think when people see cheesecake they’re too thrilled to notice a crack anyway, but the baker always does. Very cool. This is such a great tip!! I would have never thought to do this. I’m knocking on wood, but I am proud to say that my cheesecakes have NEVER EVER cracked. I think the reason is because I follow Greenspan’s instruction of leaving the cheesecake in the oven with the door slightly ajar with a wooden spoon after the cheesecake has baked. In order to avoid overcooking it, turn off the oven about 10-15 mins before the cheesecake is done. I also use a water bath, but leaving the cheesecake in the turned-off oven for 1 hour does the trick for me because it allows the cheesecake to gradually cool down. oh, and after taking it out of the oven, I aloow it to cool on the counter for another hour before placing it in the fridge. 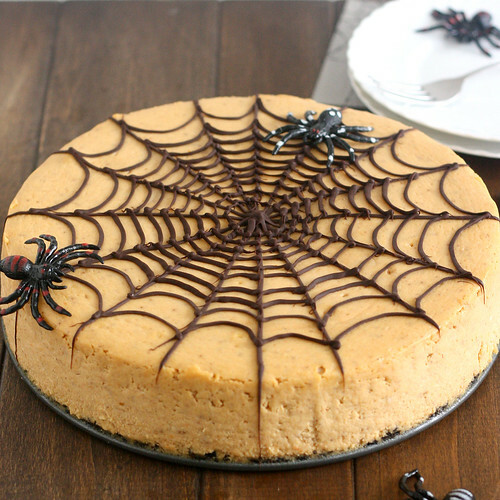 However, if I ever get a cracked cheesecake, I now know what to do! Thanks! You did a tremendous job fixing your cheesecake. My favorite cheesecake recipe is Pina Colada & it usually cracks. I pour some pineapple ice cream topping over the top. It’s even more delicious & no one can see the crack. Thanks for such a great tip. I make a lot of cheesecakes and every now and again they crack. Usually I resort of some cream and fruit, or a thin layer of chocolate but I love the idea of doing some repair work first. That is really a good tip. Thank you..
For real? I always get cracked cheesecakes. This is awesome. What a great tip!! I am not a big cheesecake person, but I will keep this in mind for sure! Great tip! I’d never seen that before! As someone previously mentioned allowing the cheesecake to cool slowly with a cracked open oven door greatly reduces cracks. I still get them though. Now I know how to fix them! thanks! Hi! Besides ALWAYS using a water bath to avoid cracks, it is sometimes useful to “tap” the air bubbles out of the cake before putting it in the oven. I double layer a dish towel to make a ‘soft landing’ for the cake, and to not scratch my counter, and then I fairly firmly and repeatedly tap the cake pan onto the dish towel and watch for the bubbles to rise to the top. I smooth them with a spatula, and have mostly great success. Mostly. Happy baking! Awesome tip! I almost always get cracks, and it gets discouraging (which is a bummer because I LOVE cheesecake). Thank you for sharing this great idea! I never knew you could fix the crack. They always happen to me as well, so this is good to know! P.S. This cheesecake sounds wonderful as well! I love making cheesecake and have never let the crack bother me. It usually seems to happen about 50% of the time. Thanks for the great tip! Wow, this is awesome! I never knew fixing a cracked cheesecake could be this easy. Thanks for sharing!! the only surefire way to fix a cracked cheesecake is to eat it all before anyone sees it and make another one…. Great fix. When I bake a cheesecake I always do a water bath and shut the oven off, leave the door open a bit and leave the cheesecake in for 30-60 minutes to cool slowly. I usually make cheesecakes with sourcream or chocolate topping, so my cracks are covered, literally. But sometimes it helps if I run a knife around the pan and loosen the cake immediately when it comes out of the oven. Then it doesn’t pull and crac as it cools.